As hard as it is for me to believe, March has arrived. Doesn't it seem like it was Thanksgiving just a week or two ago? This month means that warm weather is (hopefully) right around the corner, thoughts of Spring Break are in the air, and it is time to look back and reevaluate any progress that has or hasn't been made on New Year's resolutions. If you're anything like the majority of people, myself included, your resolution to live a healthier lifestyle may have already come to a halt (or, in my case, never really began). Why is it so difficult to stay on track? For me, one major aspect is that I try to make a full life overhaul instead of focusing on how small changes can add up. Am I really going to give up all sweets and begin working out five days a week? Ha! However, looking for simple solutions is much easier (and more attainable), which is why I am excited to instead be able to make a Replacement Resolution with Musselman's. Musselman's fully believes that making healthy, delicious apple sauce is more than just a job, it's a way of life for this 100-year-old grower-owned cooperative. Along with their traditional apple sauce, they offer apple sauce blended with other fruit flavors, lite apple sauce for those who are counting calories, apple juice, apple butter, and more. But as well as their variety of great products, Musselman's Replacement Resolutions are an easy way to help you and your family stay on track. 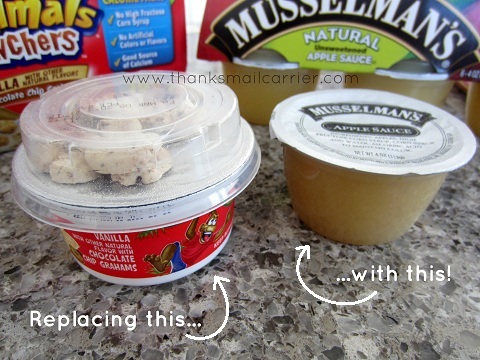 All you have to do is swap out one of your favorite snacks with Musselman's apple sauce. It’s that easy! Replace an unhealthy snack with one that is healthy as well as delicious? The bigger question is where to start first! ...it didn't take me long to find the perfect place to begin: packed lunches. I know that I'm not the only mom to struggle to come up with ideas as to what to pack in her kids' lunchboxes, so I find that I'm often giving my husband vague instructions before he heads to the grocery store. Get some yogurts for them, I'll say, followed by, I don't know. Crackers, maybe? Which is why I can't blame him completely when what ends up coming home isn't... exactly what I would have chosen from the shelf. It's time to cut the calories by resolving to replace the sugary yogurts with healthy and delicious Musselman's apple sauce. In each 4oz Musselman's apple sauce, there are only 50 calories, 0 grams of fat and 8 grams of sugar (which come directly from the apples themselves, as there is no sugar added to these yummy little cups). In comparison, this yogurt concoction that my husband brought home (you had a coupon for these, right, Honey? Otherwise, why?) are in 3.5oz cups and contain 100 calories,1.5 grams of fat and 11 grams of sugar. Considering that my girls love Musselman's apple sauce, I'm definitely going to be swapping out future yogurts with these healthy little cups! They'll receive half the calories, no fat or cholesterol, low sodium and all of the healthy goodness from fresh, seasonal apples! While I can't say that any of us have taken up yoga with our new Musselman's yoga ball yet, I'm still happy that we have been able to seamlessly replace a variety of not-so-healthy snacks with a tasty cup of apple sauce instead. Forget the 100-Calorie Packs and miniscule portions, I'll take a refreshing and delicious cup of apple sauce instead! 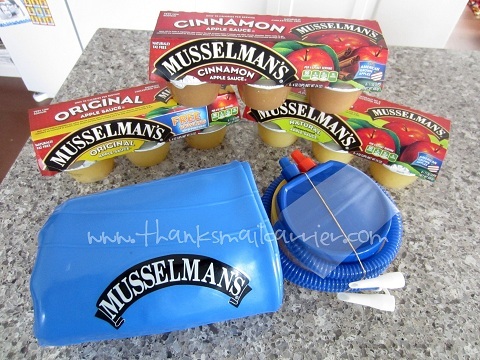 Be sure to visit Musselman's website and connect with them on Facebook and Twitter to find out more about their whole line of products, find coupons and check out their recipes. *Prize Pack contains (3) six-packs of Musselman's apple sauce (Original, Natural and Cinnamon) and a Musselman's yoga ball and pump. bars. my children are addicted to snack bars! ice crem and cookies, when watching TV and snacking at night. My afternoon snack...which is usually a couple of cookies. probably the late night snacking of potato chips. I don't know that I would replace anything but I could add it to Boo's choices! I will replace potato chips with applesauce! I'm replacing my morning "coffee breakfast" with a smoothie instead. Maybe my 2 girls will give up a pudding dessert for applesauce a few nights/week! evening donut. no need to increase the calories that aren't coming off while watching tv from my couch! 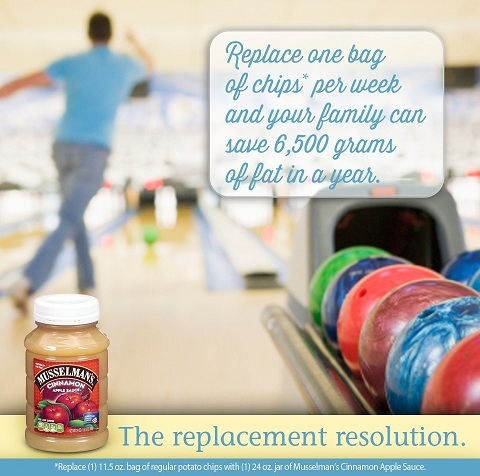 what unhealthy snack you might replace with Musselman's apple sauce! I should take cookies out of my diet. fruit snacks,,,,yep, they are not really fruit! My afternoon cookie habit... that would be great to replace with something healthier! I would replace chips. Thanks. I would replace apple pie with this! candy. I also like to replace applesauce for oil in baking recipes! I would replace greasy chips. I would replace chocolate pudding !! The sugary yogurts my kids love. I would replace chips with the Musselmans apple sauce. My kids love applesauce and eat it pretty much daily. I am not big on juice and junk food, so really I wouldn't be replacing it for anything. My family naturally loves it already. I like to use applesauce as a substitute for part, or all of the butter or oil called for in dessert recipes. I tend to eat way too many cookies; I'd try to replace at least some of them with the Musselmans. I would replace my Chocolate pudding that I like to eat. I'd use it in place of oil in baking. Chips.. all that carby starchy stuff! I would replace salty peanuts. I really try not to keep junk food in the house. I don't have kids. I do eat no-sugar applesauce. We eat a paleo diet, so we do not typically eat unhealthy. We sure do consume some applesauce though! I would replace those heavy pudding cups with the applesauce. I would replace potato chips with apple sauce. Would replace a processed packaged treat....cookies probably. Perhaps my mocha. Thats really the only sorta unhealthy snack I consume regularly. I would replace cookies and puddings! Microwave popcorn-it is so good-but i would be willing to try! Id replace ice Cream Bars! My peanut butter cookies and twizzlers. I would replace the candy I eat while I am sitting at my desk. I would use the applesauce to replace cookies! 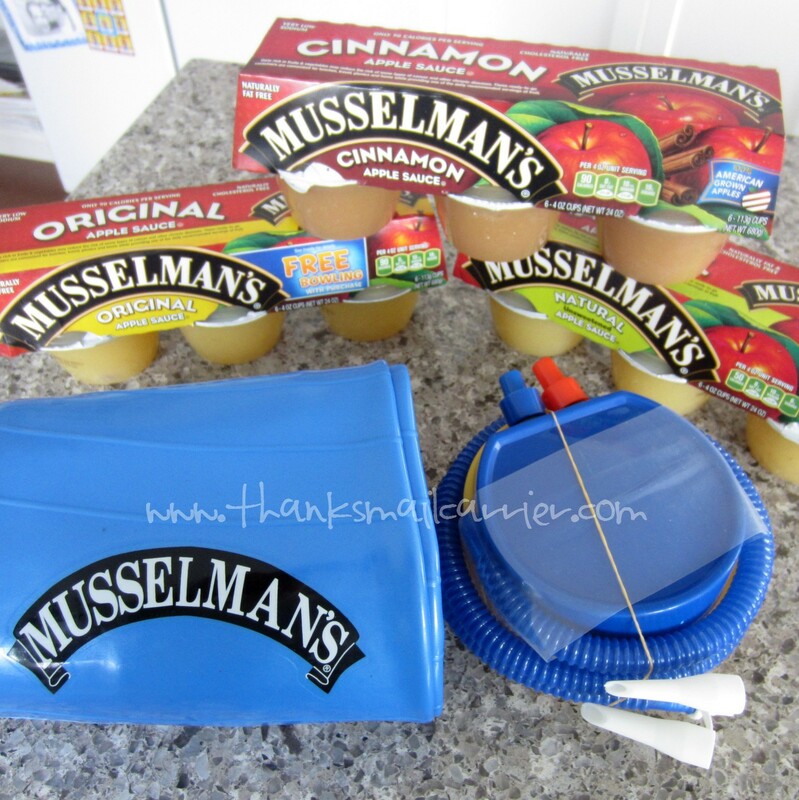 I'd love to replace sugary snacks (like chocolate) with Musselmans! Pudding cups are my weakness. I could replace cookies with it. I need to replace my ice cream addiction. I'd use it to replace ingredients in cake. I would eat less ice cream and more applesauce! I would replace potato chips.